Analytical chemists, packaging and device engineers, formulation development scientists, component suppliers, regulatory affairs specialists, and toxicologists will all benefit from the wealth of information offered in this important text. DOUGLAS J. BALL is a board-certified toxicologist (Diplomate of the American Board of Toxicology) and currently employed by Pfizer Inc. as a Research Fellow in drug safety R&D specializing in regulatory strategy and compliance. He chairs the Extractables and Leachables Safety Information Exchange (ELSIE) Board of Directors, and the Toxicology Team of the Product Quality Research Institute (PQRI) Leachables and Extractables Working Group for both OINDP and parenteral and ophthalmic drug products. DANIEL L. NORWOOD is a Distinguished Research Fellow in Analytical Development at Boehringer Ingelheim and has more than thirty-five years of professional experience. He chaired the PQRI Leachables and Extractables Working Group and is a thirty-two-year member of the American Chemical Society (ACS). Dr. Norwood is a member of the ELSIE Board of Directors. CHERYL L. M. STULTS is a Senior Fellow at Novartis Pharmaceuticals Corporation, focusing on materials analysis and characterization. She chairs the International Pharmaceutical Aerosol Consortium on Regulation and Science (IPAC-RS) Materials and Leachables and Extractables Working Groups and is a member of the ELSIE Board of Directors. Dr. Stults is a thirty-three year member of the ACS. LEE M. NAGAO is a Senior Science Advisor in the Pharmaceutical Practice Group at Drinker Biddle & Reath LLP. As a member of the IPAC-RS Secretariat, Dr. Nagao supports the Consortium's initiatives in materials quality, leachables and extractables, supplier quality, and foreign particles. She was a member of the PQRI OINDP Leachables and Extractables Working Group and serves as Science Advisor and Secretariat to the ELSIE Consortium. Dr. Nagao is a member of the ACS and the AAAS. Part I. Development of Safety Thresholds, Safety Evaluation, and Qualification of Extractables and Leachable in Orally Inhaled Nasal Drug Products. 1. Chapter 1. 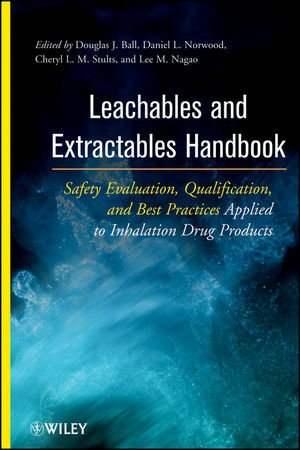 Overview of Leachables and Extractables in Orally Inhaled and Nasal Products (Douglas J. Ball, Daniel L. Norwood, Lee M. Nagao). 2. Chapter 2. A General Overview of the Suitability for Intended Use Requirements for Materials Used in Pharmaceutical Systems (Dennis Jenke). 3. Chapter 3. Concepts and Application of Safety Thresholds in Drug Development (David Jacobson-Kram and Ronald D. Snyder). 4. Chapter 4. The Development of Safety Thresholds for Leachables on Orally Inhaled and Nasal Drug Products (W. Mark Vogel). 5. Chapter 5. The Analytical Evaluation Thresholds (AET) and its Relationship to Safety Thresholds (Daniel L. Norwood, James O. Mullis, Scott Pennino). 6. Chapter 6. Safety Thresholds in the Pharmaceutical Development Process for OINDP: An Industry Perspective (David Alexander and James Blanchard). 7. Chapter 7. The Chemistry and Toxicology Partnership: Extractables and Leachables Information Sharing Among the Chemists and Toxicologists (Cheryl L. M. Stults, Ronald Wolff, Douglas J. Ball). 8. Chapter 8. Use of Safety Thresolds in the Pharmaceutical Development Process for OINDP: US Regulatory Perspectives (Timothy J. McGovern). 9. Chapter 9. The Application of Safety Thresholds to Quality Leachables from Plastic Container Closure Systems Intended for Pharmaceutical Products: A Regulatory Perspective (Kumudini Nicholas). Part 2. Best Practices for Evaluation and Management of Extractables and Leachables in Orally Inhaled and Nasal Drug Products. 10. Chapter 10. Analytical Best Practices for the Evaluation and Management of Extractables and Leachables in Orally Inhaled and Nasal Drug Products (Dan Norwood, Cheryl Stults and Lee Nagao). 11. Chapter 11. Chemical and Physical Attributes of Plastics and Elastomers: Impact on the Extractables Profile of Container Closure Systems (Michael A Ruberto and Diane Paskiet). 12. Chapter 12. Pharmaceutical Container Closure System – Selection & Qualification of Materials (Douglas J. Ball, William P. Beierschmitt, and Arthur J. Shaw). 13. Chapter 13. Analytical Techniques for Identification of Extractables and Leachables (Dan Norwood, Thomas N. Feinberg, James O. Mullis, and Scott Pennino). 14. Chapter 14. Extractables – The Controlled Extraction Study (Thomas N. Feinberg, Daniel L. Norwood, Alice T. Granger, and Dennis Jenke). 15. Chapter 15. Extractables – Case Study of a Sulfur Elastomer (Daniel L. Norwood, Fenghe Qiu, James Coleman, James O. Mullis, Alice T. Granger, Keith McKellop, Michelle Raikes, John Robson, David Olenski, John Hand, Sr., Melinda K. Munos, Tianjing Deng, Xiaochun Yu, Derek Wood, Shauang Li, Song Klapoetke and Xiaoya Ding). 16. Chapter 16. Extractables – Case Study of a Polypropylene (Diane Paskiet, Laura Stubbs, and Alan D. Hendricker). 17. Chapter 17. Leachables – Analytical Leachables Studies (Andrew D. Feilden and Andy Rignall). 18. Chapter 18. Development and Optimization of Methods for Routine Testing (Cheryl L. Stults and Jason M. Creasey). 19. Chapter 19. Critical Component Quality Control and Specification Strategies (Terrence Tougas, Suzette Roan, and Barbara Falco). 20. Chapter 20. Inorganic Leachables (Diane Paskiet, Ernest L. Lippert, Brian D. Mitchell, and Diego Zurbriggen). 21. Chapter 21. Foreign Particulate Matter (James Coleman, John A. Robson, John A. Smoliga, and Cornelia B. Field).